Need a last minute idea for Mother's day? Don't know what to make for your beloved mother? This fruit recipe will wow everyone, my friends wanted seconds and even thirds. 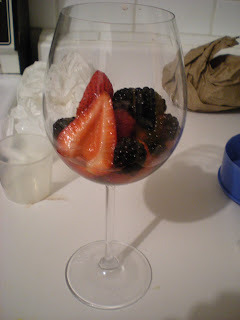 I am even impressed of myself when I made this dessert on Friday. This recipe is quick and easy, and it only takes a few minutes of your time. 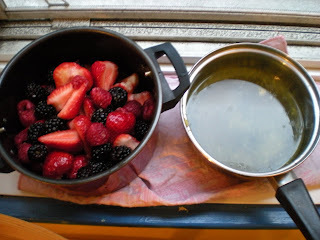 It consists of a variety of berries, mixed into a lemon syrup. 1. 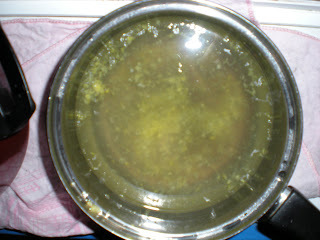 Bring water and sugar to a boil in a small saucepan over medium heat, stir until dissolve. 2. Stop stirring, increase heat to high, and let it boil for 2 minutes. 3. Remove from heat. Stir in zest, lemon juice and mint and let it cool completely. 4. Cut large strawberries in half with tops removed. 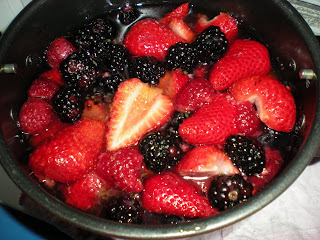 Combine berries in a large bowl and add lemon syrup. Stir gently to coat evenly. Cover and refrigerate until chilled. 5. Spoon into bowls or wine glasses for Mother's day along with the syrup and top it with a large dollop of whipped cream and serve. That summer meldey looks and sounds amazing! Thanks for sharing would love to try that out sometime this week!